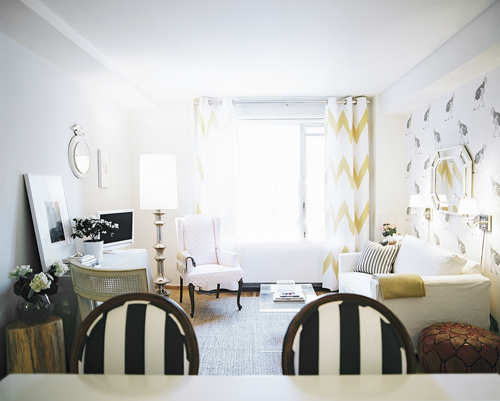 I was flipping through the latest issue of e-magazine Lonny yesterday when I came across the New York apartment of Michelle Adams who is one of the founders of Lonny magazine (along with Patrick Cline) and is the designer behind the brand Rubie Green whom I've featured here before. Michelle recently renovated her city apartment to be a bit more eco-friendly and since I love yellow and white her place really sang to me. Living room notes: Decorating was a challenge because my apartment is in a post-war building with NO CHARACTER, and it resembled the gross high-rise buildings that make me cringe. So I knew I had to inject some serious charm into it fast! I didn't have much money to spend on the re-do, so I decided to use the ostrich wallpaper (which I'm OBSESSED WITH!) on the main wall in my living/dining room to not only tie the space together and create a strong focal point, but to also ensure that I didn't need to hang much on my walls! Rather than buying a bunch of art for above my sofa, the busy paper allowed me to simply hang a vintage mirror (another obsession- $20 at the flea market!) 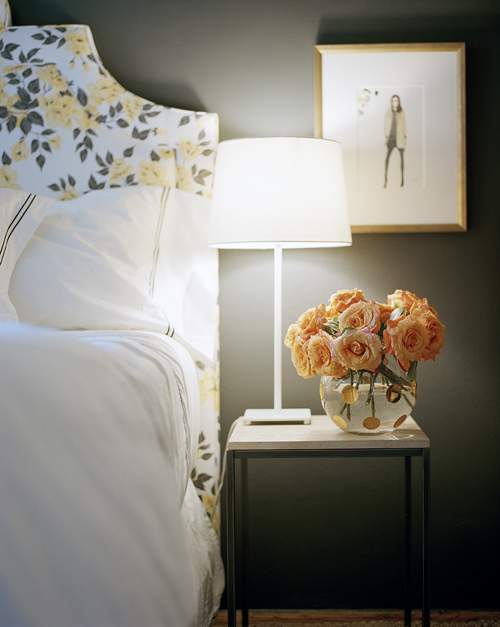 flanked by two sleek sconces. And that's it! The curtains were custom made from my Rubie Green Bryn fabric, and I had them finished with grommets to keep the look laid back and beachy. The fabric itself reminds me of an outdoor canopy, and I chose the yellow because it's unexpected and it pulls out the little bit of yellow in the ostrich paper (where he's sticking his head in the sand). 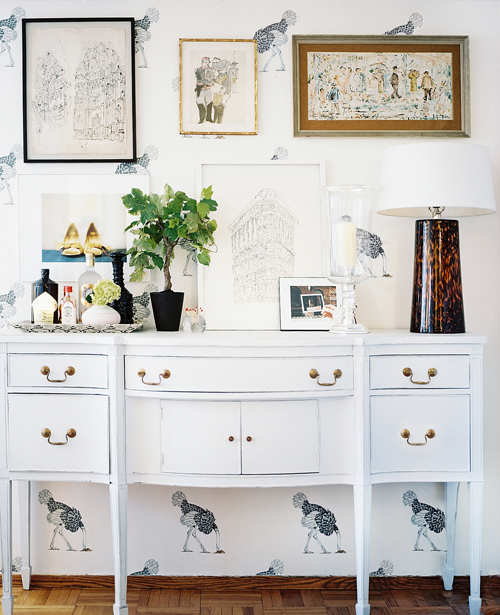 My obvious obsession in this room is my vintage credenza! I went to Furnish Green looking for a vintage desk, and stumbled upon this beauty and practically screamed! It's huge and elegant without feeling pretentious, and since it's over 100 years old I love imagining the other women who must have owned it, and what they used to fill it with. On top is some of my favorite art that I've collected over the years at the flea market. The black framed line drawing on the upper left corner is an original piece that I found for $60 at the flea market underneath a pile of DVDs! So when I stumbled upon the white line drawing (in the middle, white frame) of the Flat Iron Building years later, my jaw dropped. It's from a local Brooklyn artist and I love how it's elegant but totally relaxed. The oil painting above it (far top right) is also from the flea market, as is the gold framed watercolor next to it, a mere $40 at Elephant's trunk market in CT. Lastly, the two photos of shoes and a Polaroid are some that Pat and I took together over the years! We sell a lot of our work on etsy. Lastly, the candle hurricane is one that I've been in love with for years and finally received as a gift a few weeks ago! 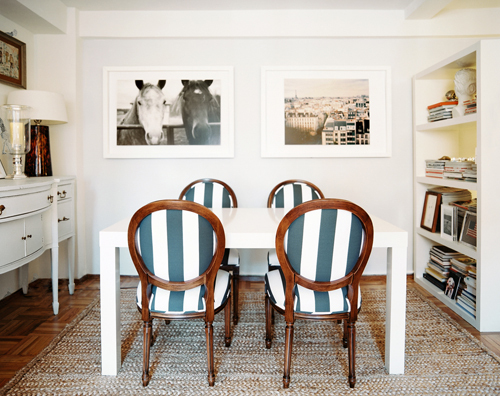 It's from Ralph Lauren and I first spotted it in domino Editor at Large Tom Delavan's home. It's timeless, and elegant enough that it sort of gives credibility to my otherwise hodgepodged art collection. My dining table is a West Elm parsons that I found on Craigslist! The previous owner had purchased it two months before selling it, because it didn't fit in her apt, so I was able to save it from a landfill and also save myself half the cost. The chairs are from Ballard Designs and I'm obsessed! They're totally classic, and I know I'll have them forever. Since Ballard does custom work, I had them upholstered in my Rubie Green Capri Stripe fabric, which reminds me of Paris! The framed photo of Paris is one that Pat and I took from the top of the Georges Pompidou Center in Paris when we traveled there last fall for Lonny! The horses were shot in New Jersey on a little farm that we stumbled upon. I had the headboard custom made a few years ago by the Furniture Joint and upholstered in my Marilyn fabric! Pottery Barn has a really similar one right now called York. The headboard fabric itself was inspired by a vintage napkin that I bought for $2 at a flea market when I was in college! The bamboo armoire is one that I found at Housing Works (an NYC thrift shop) for $365! When I found it I literally wrapped my body around it and begged my assistant to take my credit card to the cashier so nobody else would buy it in the meantime - ha ha. Lastly the sofa is from Williams Sonoma Home and I'm obsessed with it too - the scale is so petite and sophisticated, yet the natural linen fabric keeps it from feeling fussy and I love that the frame is made from sustainably harvested wood. The rug is awesome too -- it's a 9x12 PB Essential Jute rug (Pottery Barn) and it's made from jute and finished with fire rather than chemicals! I love this one in particular because it's soft underfoot- it almost feels like wool, and since I couldn't afford wall to wall sisal carpeting, the huge size was the perfect alternative. 1. Do your homework: Ask questions and read product descriptions to find out exactly how products are really made. If you're unclear about something, don't hesitate to pick up the phone and call customer service to ask. Companies that make the effort to truly manufacture earth friendly items will be happy to tell you all about them. 2. Start with a clear inspiration in mind: Rather than looking for eco products and buying them simply because they're earth-friendly, figure out what style you're hoping to achieve and select your furnishings accordingly. In my own apartment, I decided early on that my inspiration was "English conservatory meets Dorothy Draper," so I searched for items that were bold (i.e. Dorothy) yet still charming, relaxed and natural. My wallpaper is clearly a bold statement, as the birds are large and highly repetitive, yet when you look closely they are delicately drawn and very feminine. 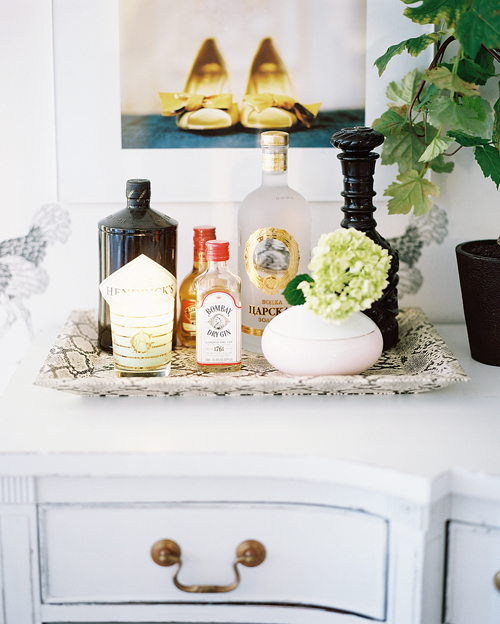 I tried to look for these sorts of juxtapositions in every piece that I brought into my home. Since I'm fascinated by flea markets, I also wanted to inject a bit of history into my decor, with pieces that have been around for decades. 5. Spread the word: If you make the effort to go green, be proud of it and share it with your friends. The more people who pick up on the movement, the better our planet will be as a result. 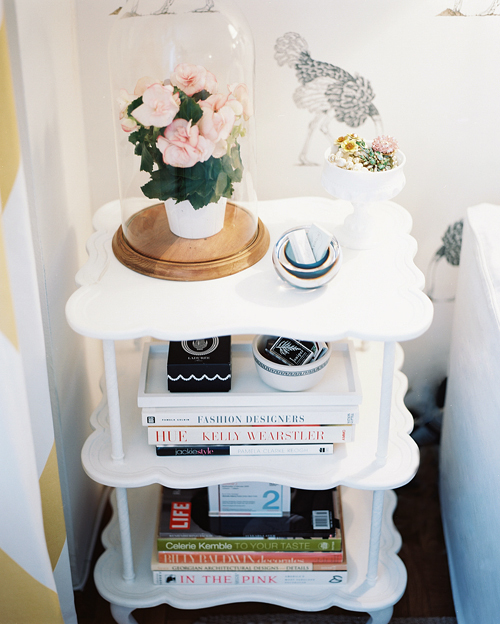 If you'd like to see more images from Michelle's apartment, or if you'd like to read Lonny online, please click here. Lonny magazine was founded by Michelle Adams and Patrick Cline who is a photographer also residing in New York.